They told us Think Different. Different like Cesar Chavez, Amelia Earhart, Jim Henson, like that was a sentence that made any kind of sense. They put on the skins of Albert Einstein and Gandhi and paraded around like they’d invented them. They told us question everything. They sprang fully formed from the minds of the circuits, born auto-didacts, not even learning to read until they were seven, when they saw no other way to make sense of the computer manual. They never finished high school. They never finished college. They made more per hour than your college professors. They sold their company to Palm for a million dollars before you’d gotten your diploma. They said, the piece of paper doesn’t matter. They wanted land and a cabin in the woods, to stave off the loggers, so it seemed at least like they knew what to do with the money. They told us, I like how you customize your interface, picking icons and pretty desktop patterns, I’ve never seen anyone do that. It’s fascinating. They told us, don’t use tampons, they’re bad for you. They’d read John Dewey and Hardt and Negri, Eric S. Raymond and Linus Torvalds. They were familiar with Ayn Rand. They took the names of Gibson characters in IRC channels and BBSes. They fawned over Cryptonomicon, and when its pompous academic asked “How many on-ramps will connect the world’s ghettos to the Information Superhighway?” they mis-heard it as a personal calling and went to Africa. They told us down with the man, up with Nanotech. A month or two back, two girlfriends of mine announced their pregnancies in a single email (knowing a couple of us from the old gang aren’t on Facebook anymore). Recently, a few of the gang who are still near our hometown got together for dinner, digging up some tensions which our group hadn’t really acknowledged beyond a few one-on-one conversations and back-channel emails. One of the women who’s expecting mentioned it in passing, sounding puzzled and maybe a little guilty that two other friends weren’t sharing in the joy. I wrote something like this back to her (names and some details changed). I think it finally captures some of the way I’ve been feeling about pregnancy announcements since my cohort’s twenty-one womb salute to heteronormativity started when we all turned thirty. And maybe it’ll help some other old groups of friends cope with their own divisions. So I’m posting it here. Given that I’m going to be producing shows on cable access soon, I feel like I should be writing more here. Because I’m meeting people, with an intensity I haven’t in years, and the quality of the interactions are just of the kind of barely-contained hysterical that I always feel like I ought to capture in this blog. If its project still is, or ever was, some sort of chronicle of the human condition. Or of encounters across borders, as it often was in its early years. I have a nagging feeling that being a young urbanite in New York has allowed me to skate across the face of life, avoiding the big questions. That the choices I make allow me to live without obligations in a way neither of my sisters can, living as close to the family as they do. Having kids. Taking care of our parents and grandparents. I’m not personally close to birth, or death. I hang out with gay men and childless friends a lot, and younger people. They told us the Internet would become an echo chamber. They didn’t tell us how deafening the echoes would be when everyone started screaming. Like the unstoppable screech of feedback from a microphone. Lately when I open Twitter, that’s the sound I hear. It gives me stomach cramps and makes me want to give everything up and go work on a farm with no Internet connection. The Internet has recently imploded into a discussion about the oppression and abuse of women, in technology and elsewhere. And yet we are not having a discussion. So often, most of us are just talking, in one direction, not listening, not responding. I’m not on Facebook anymore, but Twitter, and more specifically the “retweet” or re-post function on many social media, seems to be making this one-way communication worse. The field of communications long ago identified a phenomenon known as Mean World Syndrome. It’s what happens when the news constantly emphasizes violence and crime — as it has always tended to, because that’s what holds people’s attention and sells copies of papers or advertising. You hear awful things are happening other places, over and over. It begins to seem as if these awful things are more likely to happen than they actually are. It’s why white people from majority-white communities are terrified that black people will do them violence: that’s all the news gives them to think about, when it comes to black people. It’s why homeschooling is on the rise: parents are sure school shootings happen all the time. People who develop Mean World Syndrome view the world as more dangerous than it actually is. In the race, class, and gender work going on on Twitter and other social media, I am sure there are people who are coming to understand oppression for the first time because of tags like #YesAllWomen. And there are also people speaking out against their oppression for the first time, and feeling better for having done it. But are we also in the process of breeding a new strain of Mean World Syndrome? A particularly insidious one, where it’s not media corporations constantly exclaiming about how awful things are, but regular people? I can’t be sure we aren’t. Management has changed due to Circumstances. Welcome to new collaborator F.
F: I’m going to stop freaking out about the Skinny Girl Vodka, and I’m going to stop freaking out about the fact the Cleveland Indians still have that mascot. G: They do have a jukebox. It has Daft Punk and Radiohead. F: (idly watching a TV) Too bad we’re not seeing those ads where they demonstrate those transition lenses that go from dark to light. The best way they could come up with to show that was to have someone moving their head as it transitioned from day to night. It’s the best representation I’ve seen of acid kicking in. Waitress: Careful, the top plate’s hot. G: That’s an indicator it’s top-broiled. F: This really is a science. You have criteria! I finally had a chance to try this this past week. 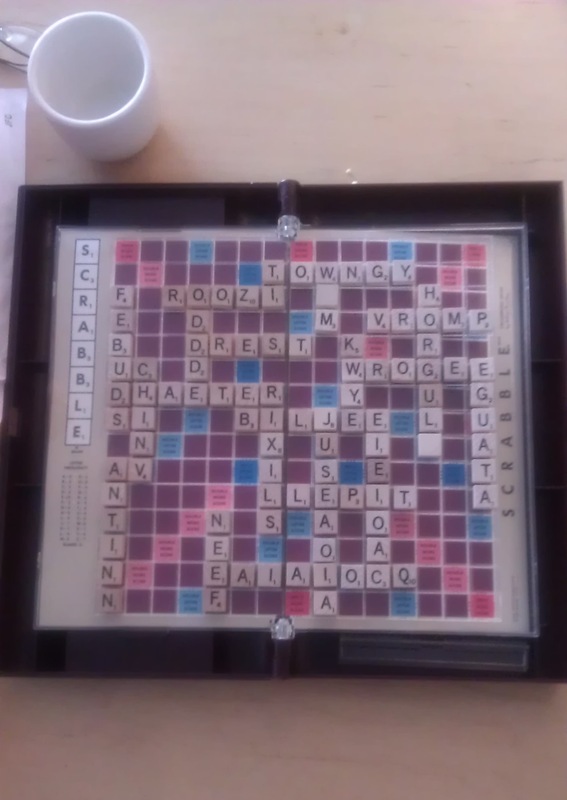 I was visiting one of my old school crew, of the gang who used to play modified versions of Hangman and Mad Libs at lunch in high school and who did at one point attempt to play a game of Scrabble in Klingon (defaulting to “Star Trek-related words” when we realized there weren’t enough Qs and Ks). I also had Finn with me, so I figured this was an ideal testbed. I wrote this to a student at the end of last semester, one who was struggling with what looked pretty clearly to me like depression and/or self-deprecating thoughts that go along with it. I never sent this. This is the kind of thing that would lose you your job. But I think it is so, so utterly, important to say. If you’re in college, this may be a letter to you, from a college professor. College staff, like high school teachers and college counselors, are not supposed to tell students not to go to college, in this day and age when the President is publicly talking about how important it is for EVERY student to go to college. We may feel that college is not for everyone, or that students ought to take a break, but we can’t say that…. because it is the opposite of doing our job. It’s the kind of thing that would probably bring the wrath of angry parents screaming into our department offices. And then, our job is in part to make sure the college continues to make money. And every student who leaves college is a student whose parents are not paying tuition, whose scholarship is not being sent to the school. Take a year off from school, if you haven’t already. Or a few years. You got a 67.7% on your midterm. You got a 58% on your … paper. You got a 72.5% on your … project. With generous adjustment (which everyone in the class got), you got only 27% on your final. You skipped a tremendous number of forum posts …. The syllabus specified these were part of your grade. Your class participation rates were fine, though you sometimes seemed lost. You had two more absences than an acceptable number; that alone took two points off your final grade and should have taken off more. The major problem in the majority of your assignments was you simply didn’t answer all of the questions. On the final particularly. I gave you a list of things to answer, and you skipped a bunch of them. Just don’t do that. Or skip homework assignments. Or class. Just showing up constitutes a significant part of your grade, not to mention people’s judgment of whether you’re a decent worker. Yesterday my community lost a brilliant light, Aaron Swartz, who did a great deal, in very few years and very young, to better the Internet and the information we have to understand it and the rest of our world. I met Aaron for the second time last year, and had been looking forward to future conversations with him. Like everyone, I am bereft at knowing those conversations will not happen. The geek community has done a lot of thinking about depression and suicide in the past few years, notably Mitch Altman and co’s great panels at 28c3 and HOPE and other organizing activities. It is especially difficult to have the news of Aaron in the wake of these panels. I know organizing doesn’t make everything better immediately. It’s just…. damn. All I can offer is what I do to save myself. Facebook, dammit, I wish I could quit you. I need to quit you. When Facebook played fast and loose with my privacy settings, I stayed. My friends kept track of how to fix them, and I’m pretty good at keeping on top of such things myself. When it got more and more obvious that Facebook’s news feed algorithm was engineered to make money, not keep me updated on people I cared about, I stayed. The benefit of staying in touch with friends and family outweighed the frustration of sometimes missing words-only messages while the site served me up yet another “inspirational” message forwarded by a business contact I barely knew, because it was a photo, and those grab attention better.